CNC-2500 is a new type of product that is used by our company for panel, solid wood and other materials processing frame products, assembly doors and so on. CNC Splicer is a machine with 45°, 90°, and 135° angles and has the functions of a three-axis cutting machine. It can be installed without requiring tool change and repositioning. 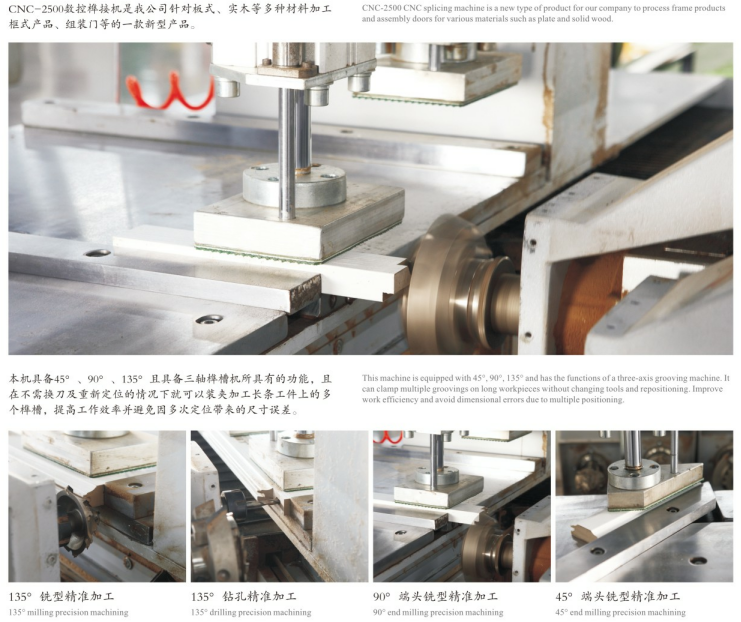 Multiple grooves on long workpieces increase work efficiency and avoid dimensional errors due to multiple positioning. The graphic file has a parameterized setting, the size, position and size of the eyelet, and the adjustment of the tightness, etc., after setting on the operation interface. There are 4 straight back plates and 2 45 degree back plates, which can carry out multi-turn and multi-position processing. The work table is long and can process long materials.